The Readers Sample Schedules posts are some of the most popular and most-visited posts on this blog. I know you love them! So be sure to drop by Tuesday and add your most recent (or any from past years!) schedules. I will have a post up linking you to all of the reader sample schedule posts so you can easily get to your pertinent sample schedule post. I will put a post up Thursday that will take you to the various posts where you can share your blog. I have a post for various categories, everything from business blogs to “just-for-fun” blogs. 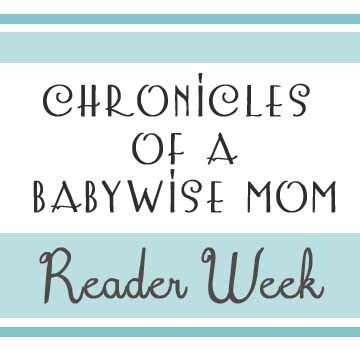 This is fun because it helps keep the Babywise community close and helps you be aware of blogs written by like-minded parents. I will put up a post Friday to link you posts where you can comment and share your favorite things. These will include baby products, toys, books, and more. Giveaways are fun because it gives you readers a chance to win something for free! Be sure to drop by Saturday for your chance to enter to win a canvas! Thanks to all of you for your kind words and thank yous as I write this blog. I know I can’t always respond to all of your comments across all of the various platforms (Facebook, Instagram, Twitter, this blog…), but I love to hear from you! I really do enjoy it and sincerely enjoy helping you. So long as you keep reading, I will keep on writing. Have a great week!